The boys continue to eat well and are becoming cleaner and neater at doing it every day. We haven’t really introduced the spoon yet, but I can see that on the horizon. Well, I say it in the header, but this adventure would fall under the “ugly” category. I decided to actually prepare and bake something yummy for them this week and it turns out, it wasn’t much of a success, at least so far. Pasta is one of my favorite things to eat. Maybe it’s because I can load up on garlic. So, I combined some ideas that I had read about and made some pasta rollups. The boys have also been eating the cooked carrot and apple pieces that I made in the crock pot and they have been a great hit. It’s nice to have some healthy finger foods for them to eat at meals. The carrots are a personal favorite as they are not as messy. Pasta Tofu Rollups Nothing about this recipe is difficult, but it does take some time, maybe more than I had anticipated. You could make it simpler by buying your own pasta sauce and maybe less messy by using shredded cheese for the stuffing instead of cottage cheese. Cook the lasagna noodles, following the directions on the package. If you are making your own tomato sauce, then wash and cut your tomatoes and zucchini into pieces. You can simmer with the oil and spices, or steam. I used my Beaba Babycook and steamed the veggies together, then added my oil and spices and pureed. Lay out your noodles and cut them half. Spread thin layers of the tofu, sauce, and cheese (in that order) on top of the noodle. I would suggest leaving one end plain to use as the tail. When wrapping, your stuffing will ooze to the end and you will also need an open piece without filling to close the rollup. Place them spiral-end up in a baking dish. Top with the remaining sauce and parmesan cheese. Bake covered in a 350° oven for 30-45 minutes. I let them cool, them wrapped them individually and froze them in a freezer bag. The rollups were super messy. I attribute this to the runniness of my homemade sauce and the cottage cheese. I would suggest adding paste, making a thicker sauce, or using one that you buy. Also, you may want to use shredded mozzarella instead of cottage cheese. I also found the rollups hard to keep rolled up. So, you may want to use a toothpick to hold them together. My boys haven’t eaten them yet, as they went straight to the freezer. I did pool together a bunch of the sauce that oozed out from the preparation and leftover cheese and noodle pieces and made a mixed pasta. They ate it and loved it. The sauce did have a yummy flavor. I’m not giving up on these as I’m anticipating pulling them from the freezer in a month or so. I also plan to try making them again with a thicker sauce and shredded cheese. After my recent revelation about using my crock pot for making batches of food to freeze, I set out to cook some apples. With gift cards received one Christmas, I treated myself to a really large, nice All-Clad Crock Pot . I am more grateful than ever for this purchase. It is a wonderful tool for cooking large amounts of food. Of course, you can use any crock pot or slow cooker for these apples. An apple a day keeps the doctor away. I grew up hearing that one (among many, many others). My boys eat applesauce weekly, sometimes mixed with other fruits or with added cinnamon. I had some organic apples that were about to be past their prime and decided it was time to cook them all. We are also making progress on our “eating with the family” goal. The boys shared another crock pot creation with us for dinner. I made chicken that just tore apart into perfect pieces for their little fingers. It made for a nice dinner together. Another small addition this week was celery. It wasn’t necessarily a new food as they’ve had it cooked into things before, but never alone. Cinnamon Apples I’ve mentioned before, but my boys love apples, so I thought while cooking in the apples in the crock pot, I would add some extra flavor. I had 7 organic gala apples, so that is what I used. I peeled them and cut them into bite size pieces, and put them in the crock pot. Then, I poured in 1/2 cup of water, 1 tsp cinnamon, 1 tsp vanilla. I didn’t add any sugar as I don’t think they need it, but some brown sugar sure would be tasty. I was in a hurry this day, so I let them cook on high for 2 hours and they were sizzling perfect. We ate a big serving and saved 2 dishes for the freezer as we were heading out of town for the weekend. Applesauce Chicken I followed this recipe from on of my favorite sites. I even included the pepper and the boys didn’t seem to mind at all. It was an easy recipe in my favorite crock pot. Celery I didn’t do anything new here…just cut organic celery stalks into bite size pieces and steamed. We stored in the refrigerator and were a nice green addition to the lunch plate this week. This was a great way to use those slightly soft apples that you aren’t crazy about biting into, but are still good and flavorful to eat. And, it makes the house smell oh, so good! This also makes for super easy batch food making cleanup. I will say that my chicken was severely over-cooked and I will probably do full breasts and less time in the pot next time. My boys loved the apples and I did too. I’m excited to see how they do after being frozen. The chicken was a great hit (even dry and over-cooked) and I think they even liked that they could eat the same thing that was on our plates. I can’t say that the celery was as well received. They ate it and it went ok, but we’re still working on it a little further. I must say that my favorite part of celery is the wings that precede it or the ranch that it gets dipped it. So, it’s a little hard for me to argue with them not embracing the flavor. The crock pot is a great way to make a large batch of fruits or vegetables. It is, of course, great for the family meals as well, but I’m looking forward to cooking more produce to soften for my boys to be able to eat easily and enjoy good, nutritious flavor. I’m also continuing with more family meals to share together. This has been a great post-birthday week. The boys have been a little wacky on napping, but we really are enjoying our second year! They’ve added wheat germ, tomatoes, and pancakes to their list of firsts this week and liked every bit of it. I finally put the ingredients that I bought for healthy flour to work this week and made some whole grain pancakes. I didn’t introduce syrup or any toppings although real maple syrup, butter, fruit jellies, peanut butter, and other spreads would be great. We also didn’t do these for breakfast, as I’m not so inclined to get up that early yet, but rather had them for lunch. I some times get the question about “when” and I will tell you that I always think ahead when planning my day, or especially something new. I put the boys down for their morning nap and went right to work making pancakes and preparing other small fruits and vegetables for meals in the refrigerator and freezer. Whole Grain Pancakes I made the pancake recipe from page 330 of Ruth Yaron’s book Super Baby Food, including the Super Flour mix from page 289. It was an easy recipe, mixing dry ingredients and adding eggs, milk and oil. I followed the recipe exactly and made them four at a time on my skillet. I moved them to cool on wire racks (after tasting one for myself, of course). Once they were cool, I kept one aside for lunch taste test and packaged up the rest with wax paper in a freezer bag. Be sure to let your pancakes bubble all the way on the first side before flipping. Also, watch for your skillet to get too hot as you’re cooking. It’s often the right temperature to start, but soon gets too hot and your pancakes will come out looking brown. Don’t mash them down or keep flipping them over as they will get tough. Top off the measuring cup with whole wheat flour. Don’t overbeat the batter. Heat your skillet until hot and just a few drops of cold water jump and sizzle. You don’t want them to just lie there or evaporate instantaneously. Pour about 2-3 tablespoons of batter on the pan. Cook until the surface is filled with bulbbles. Flip and cook the other side 1 to 2 minutes more. Do not continue flipping or press down on the pancake or it will be heavy and tough. Spinach & Tomato Sauce With the addition of tomatoes this week, I decided to blend some together with spinach and garlic powder. This made a yummy sauce that I’ve served as a puree on a spoon and plan to mix with some whole wheat pasta for a single dish meal as well. A great way to have pancakes ready for breakfast is to make a batch ahead of time and freeze them for up to 3 months. They can heat in the oven or toaster oven for just a few minutes or just a few seconds in the microwave. To keep them separated and fresh when frozen, I placed 3 of them on a folded piece of wax paper. 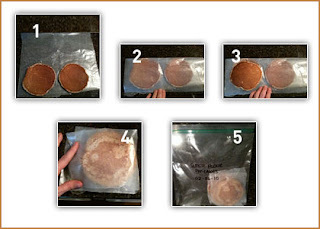 I had 4 of these groups to freeze, making 12 total pancakes in my freezer bag. See the example below. The pancakes were a great finger food addition to lunch and provided a nice, healthy alternative to bread, bagels, or crackers. I felt great about the ingredients and both boys liked the taste and texture. I’m excited about these new pancakes and look forward to thawing and serving for breakfast with a yummy topping soon!